This experiment will be the second in a series about lead aprons. As you may recall from the last Significant Experiment; there was never a point that the .25 was better than the .375 or that the .375 was better than the .5. But the ion chamber was placed less than an inch from the patient so there was no proof that things wouldn’t be noticeably different at a distance. A while back the Outpatient Surgery department called me to ask what thickness of lead they should purchase. There were physicians who used a LOT of flouro for ERCP’s and they wanted to make sure that their nurses were being effectively protected. I told them that I would figure it out and call them back. That afternoon one of my student’s and I proceeded to do the following experiment. For these exams, the physician stands at 90 degrees to the patient and the nurse next to him/her at 60 degrees. Our goal was to discover if at 2-6 feet of distance from the patient did the .25mm lead aprons shield as well as the .5 aprons and what was the difference in radiation dose when standing at 90 degrees to the midsagittal plane of the phantom versus 60 degrees off of perpendicular? 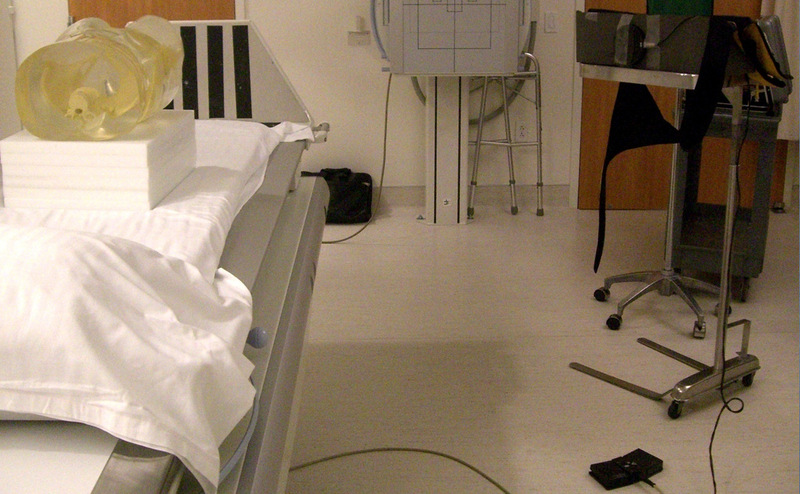 As seen in the 1st photo, we took the abdomen phantom and placed it on top of 6 inches of polyethylene to simulate a large 225 lb patient, which is an average size for ERCP patients. The II is 4” above the abdomen which would be about normal for an II (C-arm) set-up. 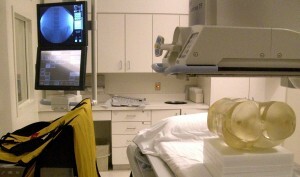 This photo shows the ion chamber placed 6’ from the patient at 60 degrees. The next step will be to cover it with lead and then make the exposure. To make sue that every exposure was as perfect as possible, I flouro’ed for exactly 60 seconds for each one. 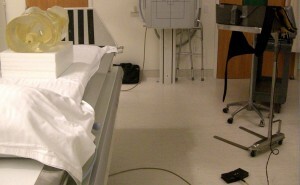 Photo 2 shows the ion chamber at 3’ from the patient and 90 degrees. The yellow apron is a .25mm. In all we made 18 of these exposures. 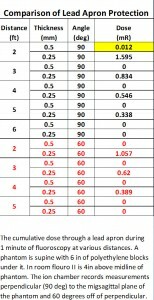 In the chart the black numbers are 90 degrees and the red are 60 degrees. 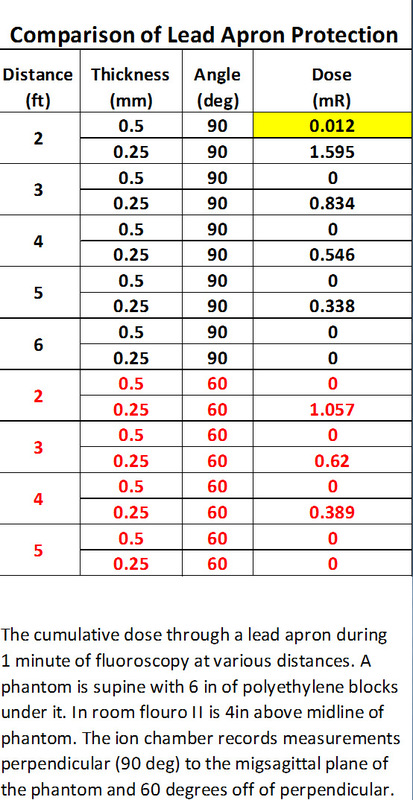 Like the experiment I presented last time, at no time did the .25 shield as well as the .5mm. Never was this more apparent than at 2’ and 90 degrees (highlighted in yellow). Here the dose getting through the .5 apron was 0.012 mR and the .25 apron let through 1.595 mR which is 130 times more radiation!! That exposure, by the way, was the only time radiation got through the .5 apron. This was certainly not the case with the .25 which needed to be 6’ away before it finally had a zero dose reading. With 60 degrees it was a bit different. No radiation got through the .5 apron at 2’ and it now took 5’ of distance before the .25 read out zero. 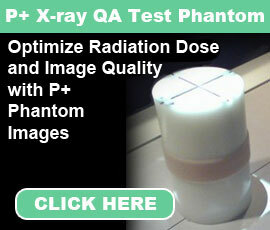 Also someone standing 60 degrees to the patient receives approximately one third less radiation. To summarize: The thicker the lead apron, the more protection you’re getting. Always!! Also the more you can get away from being perpendicular to the patient the less dose you’ll receive.